Chinese Xiaomi has launched the new Redmi 7 series device Xiaomi Redmi 7 in an official event in China today. The Redmi 7 comes with a dual rear camera with AI capabilities and has a rear-mounted fingerprint scanner. The device runs on the MIUI 10 based on Android 9.0 Pie out of the box and it comes with Corning Gorilla Glass 5 Protection on the front. The device features gradient finish on the back and features P2i nano-coating that makes it splash proof. The Redmi 7 is priced at 699 yuan (around $104) for the 2GB RAM + 16GB inbuilt storage, 799 yuan (around $119) for the 3GB RAM + 32GB inbuilt storage variant and 999 yuan (around $148) for the 4GB RAM with 64GB storage variant. It will go on sale in China from March 26th with Blue, Red and Black colour options. 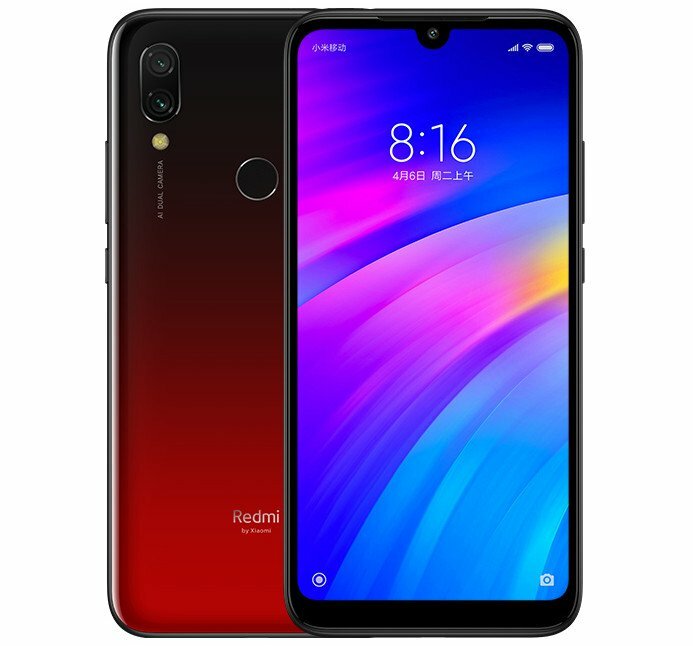 The Xiaomi Redmi 7 features a 6.26-inch HD+ 19:9 2.5D curved glass display, 84% NTSC Color Gamut, 1500:1 contrast ratio, Corning Gorilla Glass 5 protection and 1520 × 720 pixels resolution and is powered by a 1.8GHz Octa-Core Snapdragon 632 14nm Mobile Platform with Adreno 506 GPU. It comes with 2GB RAM + 16GB internal storage / 3GB RAM with 32GB storage / 4GB RAM with 64GB storage and expandable storage support up to 512GB with microSD card slot. It runs on the company's newest Android 9.0 (Pie) based MIUI 10 OS out of the box. It supports Dual SIMs (nano + nano + microSD). It has a dual rear camera with a 12-megapixel camera with LED Flash, 1.12um. pixel size, f/2.2 aperture, PDAF and a secondary 2-megapixel camera. It also has an 8-megapixel front-facing camera. It comes with a 4000mAh battery and supports Dual 4G VoLTE, WiFi 802.11 b/g/n, Bluetooth 4.2, GPS + GLONASS, 3.5mm audio jack connectivity options and FM Radio support as well. It has a fingerprint sensor on the rear side and also comes with an infrared sensor. It is Splash resistant with P2i nano-coating making it splash proof. It measures 158.73×75.58×8.47mm weight of 180 grams. No details are currently available about its global rollout as of now. Last year, the company launched the Redmi 6 smartphone that features a 5.45-inch HD+ 18:9 2.5D curved glass display, 1000:1 contrast ratio and 1440 × 720 pixels resolution and is powered by a 2GHz Octa-Core MediaTek Helio P22 (MT6762) 12nm processor with 650MHz IMG PowerVR GE8320 GPU. It has two variants, one with 3GB RAM with 32GB storage and the second one with 4GB RAM with 64GB storage and both supports expandable storage with up to 256GB with microSD card slot. It runs on the Android 8.1 (Oreo) with MIUI 9 on top and supports Hybrid Dual Sims. It features a dual rear camera with a 12-megapixel rear camera with LED Flash, 1.25μm. pixel size, PDAF, f/2.2 aperture along with a secondary 5-megapixel camera. It also has a 5-megapixel front-facing camera with f/2.2 aperture. It is backed up by a 3000mAh battery and supports connectivity options such as 4G VoLTE, WiFi 802.11 b/g/n, Bluetooth 4.2, GPS + GLONASS, 3.5mm audio jack and also has dual microphones. It has a fingerprint sensor available on the rear side. It measures 147.5×71.5×8.3mm and weighs 146 grams.